The Body Tracker allows you to record and monitor the progress of a range of customizable measurements. The Body Tracker is primarily targeted towards keeping track of body measurements such as Body Weight, Body Fat, Waist Circumference, etc but it can be extended to record any other metrics that you might be interested in (which could include such things as Calorie and Macronutrient intake for example). Tap the button on the Home Screen and select Body Tracker. By default there are just 2 basic body measurements enabled for tracking: Body Weight and Body Fat. Tap the button to open the Measurements Screen if you would like to configure this list. 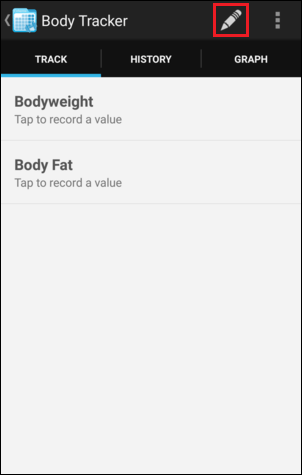 In addition to Body Weight and Body Fat mentioned above, the Body Tracker also includes a selection of additional common body measurements which are disabled by default. 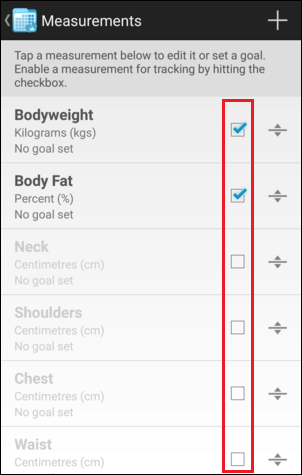 Tap the checkbox to the right of a measurement to enable it for tracking. Once a measurement has been enabled it will become visible on the Track, History, and Graph screens. Note that disabling a measurement will NOT delete any values that have already been recorded for that measurement. This allows you to re-enable the measurement in the future and resume tracking from where you left off. If you would like to remove all records belonging to a measurement then see Edit a Measurement below. 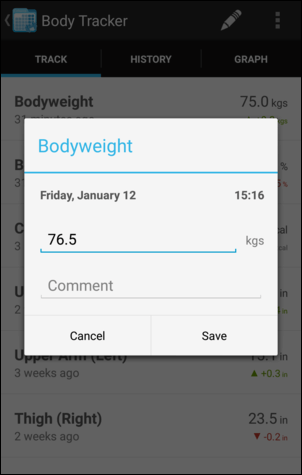 Tap the button on the Measurements screen to create a new measurement. Enter a Name for the new measurement. [Optional] Select a Unit for the measurement. 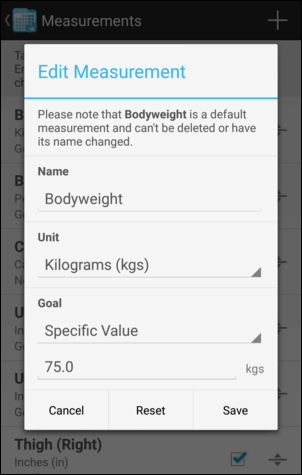 There are a series of units included by default - Kilograms (kg), Pounds (lbs), Centimetres (cm), Inches (in), Percent (%) - or you can tap the button to the right of the Unit field to create a custom unit. Increase: When you record a value for this measurement which is greater than the previous value then this will be highlighted with a green upward-facing arrow on the Track screen and in the History to indicate that it is a positive change. Conversely, if you record a lesser value then a red downward-facing arrow will be shown to indicate a negative change. 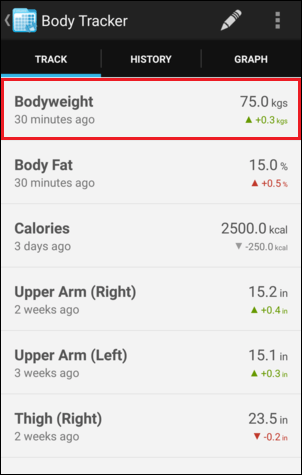 Decrease: Decreasing values recorded for this measurement will be highlighted with a green downward-facing arrow and increasing values will be met with a red upward-facing arrow to indicate good/bad changes respectively. Specific Value: Enter the specific value that you are targeting for this measurement. This value will then be displayed on the measurement's Progress Graph. 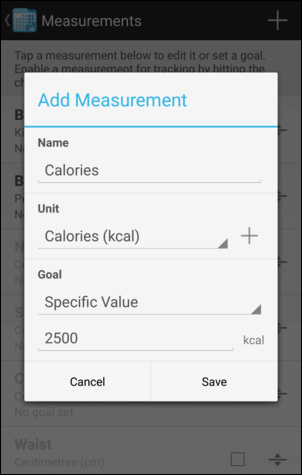 Tap Save to create your new measurement. This new measurement will be displayed at the top of the Measurements list and will automatically be enabled for tracking. 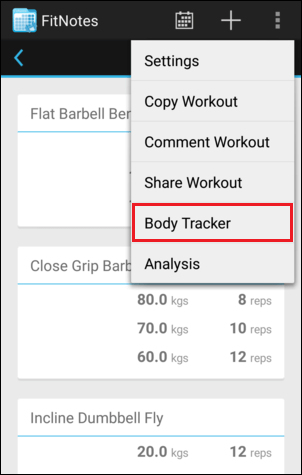 Tap a measurement in the list to edit its details. It is not possible to edit the Name of a default measurement or to delete it from the list but you can disable the default measurement and create a custom measurement to take its place. 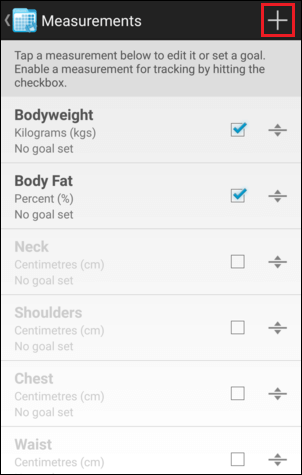 You are able to edit the Unit and Goal for default measurements however. You can also Reset the measurement which will remove all values which have been recorded for it so far. 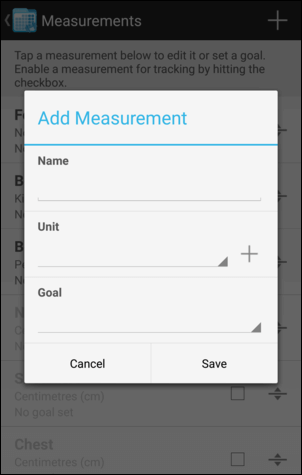 You can edit the Name, Unit, and Goal for any custom measurements you have created. You are also able to Delete the measurement to remove it entirely. 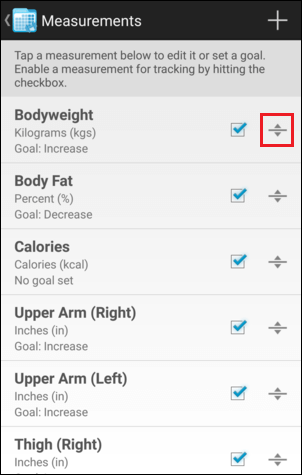 Press-and-hold the icon to the right of a measurement and drag it to a new position in the list. The Track screen displays the measurements that you currently have enabled for tracking. 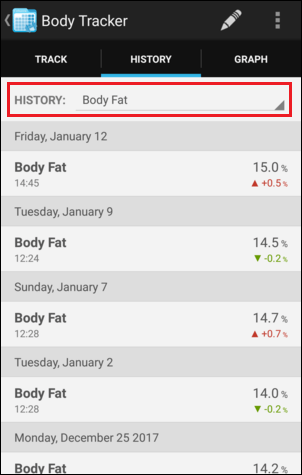 The last value recorded for each measurement is displayed on the right side along with the increase/decrease from the value before that (e.g. +0.5 kg). 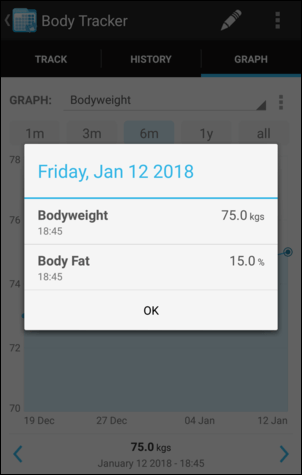 The time since the last value was recorded is also shown beneath the measurement name. Tap a measurement in the list to record a new value. The previous value recorded for this measurement will be shown in the value textbox initially so that you can reference it if necessary. Tap the textbox and enter the new value. You can also record a comment if you would like to make a note of any extra details which might be relevant. Tap the date and/or time displayed above the value textbox if you would like to change them (e.g. to record a value which was measured earlier in the day). The History screen displays the measurements which were recorded on each date. The value recorded for a measurement is displayed on the right side along with the increase/decrease (delta) from the previous value (e.g. +0.5 kg). The colour of this delta value is dependent on the goal that has been configured for the measurement (see create a custom measurement for more details). Tap the dropdown list displayed at the top of the screen to display the history for a specific measurement. 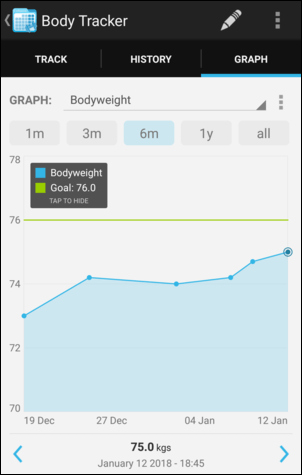 The Graph screen displays the progress of a selected measurement over time. 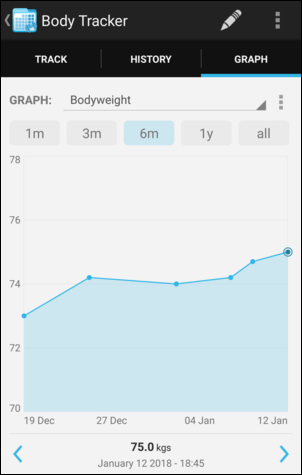 Tap the dropdown list above the graph to select a different measurement. 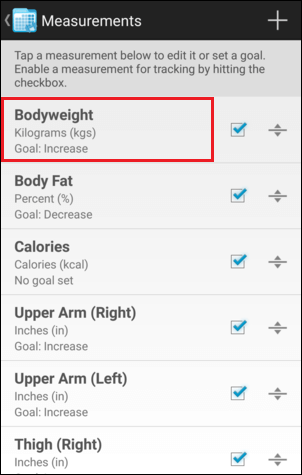 If you have configured a Specific Value goal for this measurement (see create a custom measurement) then this will be shown on the graph. 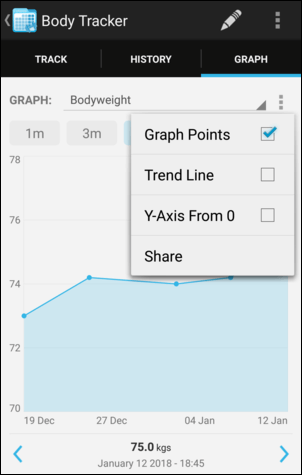 Tap a point on the graph and the exact value recorded will be shown beneath the graph. You can then tap this value to view all other measurements recorded on the same date. Tap the button to view some additional options. See Progress Tracking - Progress Graphs for more information about each of these options.